The genius of this swag is in its lines. No matter how you turn it to create folds, the swag looks great because both sides are made of the same fabric. This project uses used two panels that you sew into one swag. It treats a 30-x-60-inch window with five 45-inch-square pieces of fabric. You can adjust the length of your swag (or have the cascade descend farther down your window) to fit a larger window by adding 45-inch-squares of fabric as needed. 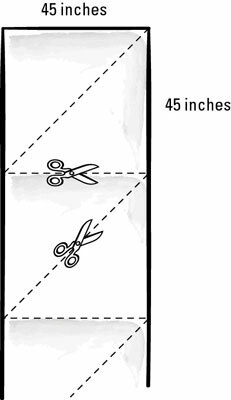 Lay out your fabric on your cutting table or workspace and cut five 45 x 45-inch squares from your fabric. Cut each of these five squares in half diagonally (that is, on the bias) to create ten triangles of fabric. 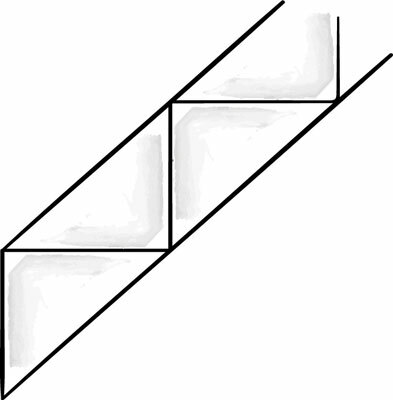 Stitch straight edge to straight edge (that is, the right-angle edges formed by cutting on the bias) so that your five triangles create one long bias-cut panel. Repeat the straight-edge stitching with the remaining five triangle pieces. You now have two matching panels. Press the seams open and flat on both panels. Lay the right sides of the two panels together so that the seams are exposed on both sides and pin all around every 6 inches, matching all sides. Using a 1/2-inch seam allowance, stitch all the way around the panels, leaving an 8-inch hole. This step can take a while, so be patient. Your two panels are now one panel. Turn the drapery right side out and press. With your sewing machine, carefully close the 8-inch hole. Find the center of your finished panel and drape it over your rod. Keep in mind the red stripe that winds around a candy cane as you work and you’ll get the desired effect. The points of the cascade will hang down 60 inches. Make sure that the longer points of the cascade are on the outside of the window you’re covering. Secure your swag on the rod by pinning your folds in the position you want and hand tacking them in position. Work underneath your curtain rod and on the back of the swag to keep the pins in place.